We’re back after a long hiatus from the DOMOTEX blog and I’m happy to say that Rita Dommermuth has successfully passed on the DOMOTEX torch to yours truly. I have been briefly introduced to ya’ll (as they say in the south) but I don’t think we have officially met. My name is Katherine León and as the Director of Sales at Hannover Fairs, USA, I will be your new contact for all things DOMOTEX. I hail from the NYC metro area, and was crazy enough to venture even further north to complete my undergraduate studies at Syracuse University. Over the past 10 years, I have worked in several capacities within the trade show and event industry and about three years ago, I decided to migrate south and settle in Atlanta, GA where fortunately we have not been pummeled by snow this winter unlike my colleagues at Hannover Fairs USA in Princeton, NJ. 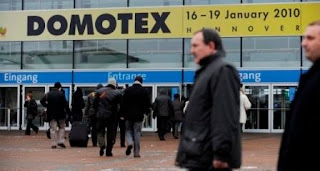 My first introduction to DOMOTEX was this past January in Hannover and now that I have that under my belt, I am thrilled about the outlook for the coming years. We wrapped up the fair with a substantial 12% increase in overall attendance from last year and we held steady with 1,395 exhibiting companies from all over the world. The Carpet Design Awards – the annual awards that recognized the best in hand made carpets. Among the winners that received prestigious prizes were Chuk Palu and Jan Kath GmbH. You can view the full list of Carpet Design Award winners. ContractWorld – located in Hall 4, attracted contractors and architects to not only receive education with the various presentations but also view quality floor covering products. The ContractWorld Awards were also presented. View the ContractWorld Award winners. Souk Deluxe – launched this year on the DOMOTEX show floor, this allowed buyers to view the latest trends in the handmade carpet sector. Take a look at all the Souk Deluxe participants. Forum Handwerk – Six years and counting, this area of the show floor which is also includes Skilled Trade Forum with cooperation of Boden Wand Decke Magazine, is a one stop shop for the skilled trade. You can also get first hand reactions from our top exhibitors at DOMOTEX from various media resources. For example, watch and listen to Dave Foster from Talk Floor get reactions from Al Kabus, President of The Mohawk Group about DOMOTEX and Mohawk’s presence in international markets. Kemp Harr from Floor Daily also spends a few minutes with Susanne Klaproth, Director of DOMOTEX, discussing some of the highlights of the show that I mentioned above. I also want to mention that DOMOTEX asia/CHINAFLOOR, the largest international trade fair for the floor covering industry in Asia and China, is coming up in a few weeks on March 23-25, 2010. Our very own Jim Gould, President of The Floor Covering Institute will be a moderator for The International Wood Flooring Summit that will take place on March 24th, 2010 as part of DOMOTEX asia/CHINAFLOOR. Other panelists include Mark Elwell, Board of Director, National Wood Flooring Association (NWFA) and Bill Dearing, President, North American Laminate Flooring Manufacturers (NALFA). Please click on the following link for further information about DOMOTEX asia/China Floors. Feel free to drop me a line at Katherine@hfusa.com if you have any questions about DOMOTEX or if you would like to discuss college basketball since my Alma Mata is now officially #1 in the nation!